Stage your event apart fro all other holiday events with dynamic, quality Corporate entertainment with professional corporate entertainer Bruce James who will presents dynamic entertainment suitable for all your corporate events. Your guest will be talking about this event for years! This comedy hypnosis holiday show after dinner speaker is known to be one of the best corporate hypnotist across the country. Let us take care of the entertainment while you (event planner) can focus on the details of the event planning. 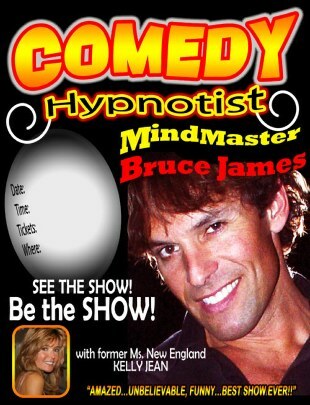 Bruce James is a master corporate entertainer performing as a comedy hypnotist. He demonstrates the power of the mind while providing excellent entertainment. The perfect choice for your corporate entertainment event, the company Christmas party, after dinner show or part of a motivational conference or sales training program. He's performed for companies coast to coast with rave reviews. Truly a great entertainment idea to motivate, focus and create enthusiasm to the company and/or sales force. Bruce James has performed coast to coast in over 35 states. 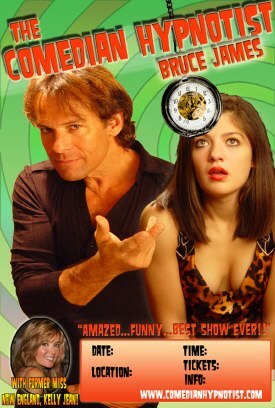 He and his assistant, Kelly Jean (former Miss New England), provide a quality adult comedy hypnosis show that is classy and entertaining. 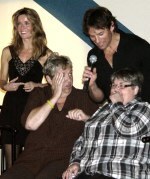 experience first hand, the amazing power of hypnosis! - We will customize the show to meet your company needs. We often end the show with post hypnotic suggestions that bring the volunteers to life again doing celebrity performances i.e. Brittany Spears, Elvis or even Richard Simmons! What type of Corporate Event Are You Having?